Beaming Baby eco nappies form a naturally breathable layer against your baby's skin; the top sheet is made with natural cotton & cornstarch fibres. Designed for superior comfort during an active day & to last for up to 12 hours. Infused with the gentle scent of chamomile & ylang-ylang to help protect baby's sensetive skin. 30% less chemicals than standard disposable nappies. 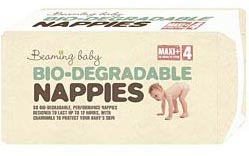 Best for your baby; each nappy has 30% less chemicals & best for the planet; every nappy is 40% more bio-degradable than standard disposable nappies. 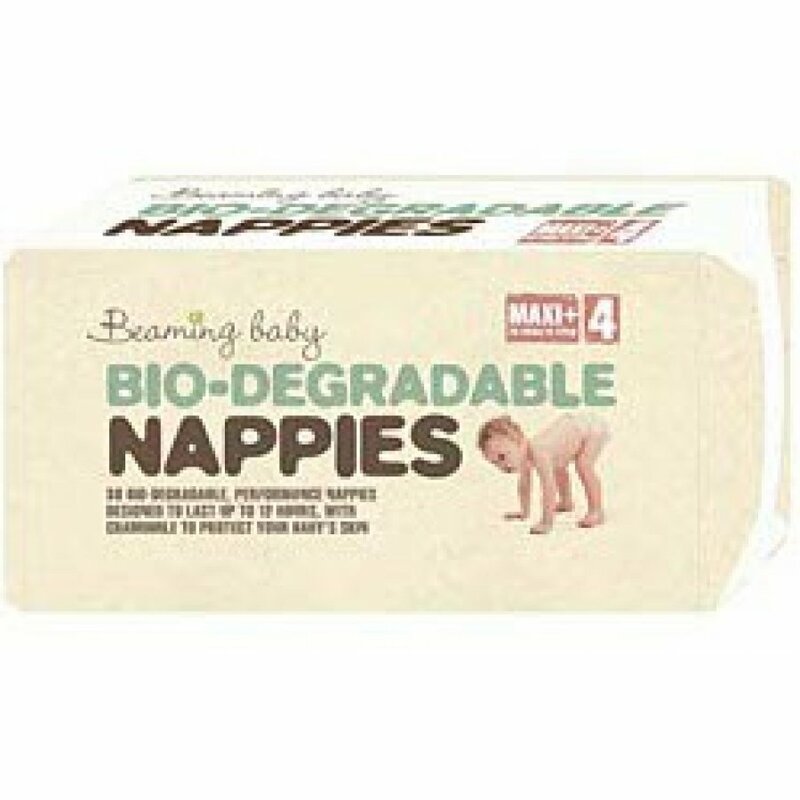 There are currently no questions to display about Beaming Baby Biodegradable Nappies - Maxi Plus - Size 4 - Pack of 34. Beaming Baby was born in Devon a little over 10 years ago, when one man and his wife, with a young niece suffering from eczema and their first baby on the way, were on the lookout for organic baby products suitable for a baby’s delicate skin. With a background in chemistry, Charlie had some knowledge of natural products that benefit the skin and those to avoid totally, and when he couldn’t find pure baby bath products that were just what he wanted, he decided to make his own! . Beaming Baby’s organic baby body care products take care of your baby’s skin and the planet. Beaming Baby are thrilled and fortunate enough to be able to donate 10% of their annual profits to worthwhile local charities.